Published by frgee on Sunday, August 31, 2003 at 9:53 AM. Published by frgee on Saturday, August 30, 2003 at 2:06 PM. home sweet home. believe it or not, i am sitting in my office in long pants and a long sleeve clerical shirt in complete comfort. it's 70 degrees in here - perfect. just a thought on airline travel: how does someone smuggle a dog onto a plane? this little rat dog started yapping right after takeoff yesterday from miami. the stewardesses just looked at one another. Published by frgee on Friday, August 29, 2003 at 4:29 PM. Published by frgee on Thursday, August 28, 2003 at 11:47 AM. Published by frgee on Monday, August 25, 2003 at 11:29 AM. did you see the thumping that the japanese team put on florida last night? pathetic. what a whipping - those kids got taken out to the woodshed. it would have been worse if not for a couple of calls that went our way early. the whole thing despressed me, but i'm over it cause i'm hanging with my buddy fr hamill for a couple of days. Published by frgee on Sunday, August 24, 2003 at 9:05 AM. tonight is the little league world series final - 6:30 - go usa! Published by frgee on Friday, August 22, 2003 at 9:11 PM. Published by frgee on at 6:00 PM. i'm going to miss td nine. oh brother. however, it appears that the long distance troubleshooting has proven effective, because i just noticed that the weather station seems to be back up and running, so i will get a state's side view of what happens during a tropical wave...hopefully the storms currently pounding the hartford area will clear in the next hour so i can get a nice evening fish on the connecticut river. Published by frgee on Thursday, August 21, 2003 at 6:49 PM. i no longer have the neither the stamina nor the eardrums for rock and roll concerts - as many of you know, i received the gift of attending the counting crows / john mayer concert last night here in hartford. the interior cranial pounding is finally subsiding. a quick review: the counting crows played with a decent intensity for 1.5 hours - the simple fact of the matter is that they are a great band. john mayer, a connecticut local boy, then came on and jammed for just an hour, but jam he did. that guy can flat-out play the guitar. i sat down in silent protest during "your body is a wonderland," but other than that the whole show was morally sound, for which i was grateful. Published by frgee on Wednesday, August 20, 2003 at 11:20 AM. i missed a day blogging while connected to the internet - has my life become so tame and mundane that i have nothing blog-worthy? i guess so. say a pray for stan as his wife is having number 6 as we speak. pray that the connecticut river level drops as well so i can get back out to those smallmouths. Published by frgee on Monday, August 18, 2003 at 5:13 PM. 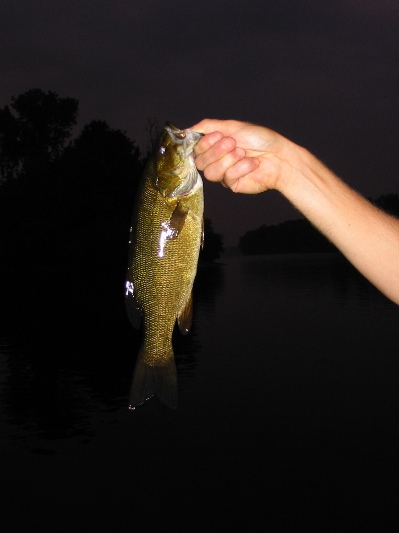 the smallmouth bass fishing in the connecticut river is splendid. my brother and i hit the water around 615 and as soon as he dropped the bow of the canoe i was hauling in smallmouth up to two pounds for the next hour and a half. these boys fight like the dickens in the current and they have the panache of an acrobat as they twist and turn after leaping out of the water. although the river was running unusually high due to the abundant rains, the water was clear and we nailed them - just so you know, we were fly fishing with 9 foot 9 weight rods using a topwater fly called a gurgler tied by my brother. nothing compares to seeing and hearing that explosion of water and fish...i'll take some pics in the next few days and post them. Published by frgee on Sunday, August 17, 2003 at 2:02 PM. minnesota rocks - the minn/st paul airport has high speed broadband wireless access. i got a more than a few odd stares as i video/audio-chatted with my friends. Published by frgee on Thursday, August 14, 2003 at 9:51 PM. today i had the pleasure and privilege of baptizing stan10's new baby, avila marie. tomorrow i head out of here at 0600 for some super small town in north western minnesota to celebrate a wedding. then i'm off to hartford on sunday where i will be back online. can you believe that i will be in the great usa and not have internet access for two days? what's going on here????? Published by frgee on Wednesday, August 13, 2003 at 6:45 PM. i struggle blogging from the states. what do i write about? the fraternal joy of golf, the intestinal regulation caused by the consumption of red meat, the frigid refreshment of cold drinks? i will say this, america rocks - there is nothing like potable tap water and reliable electricity, that's for sure. Published by frgee on Tuesday, August 12, 2003 at 9:20 PM. 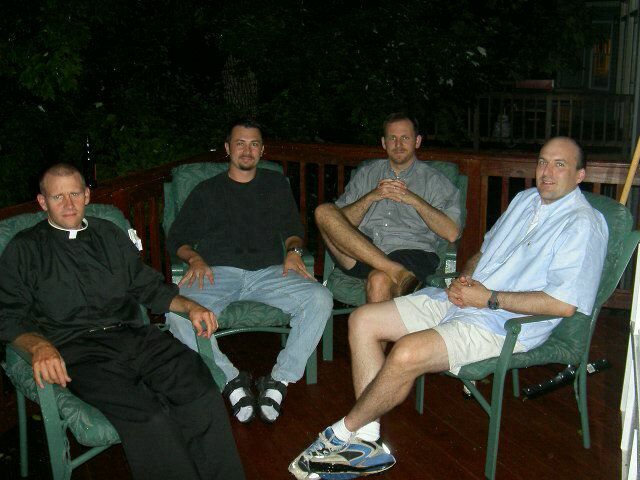 i am sitting on stan10's deck drinking a michelob ultra light - stan10's pontification humbles me. what more needs or may be said. Published by frgee on Monday, August 11, 2003 at 4:54 AM. Published by frgee on Sunday, August 10, 2003 at 7:26 AM. 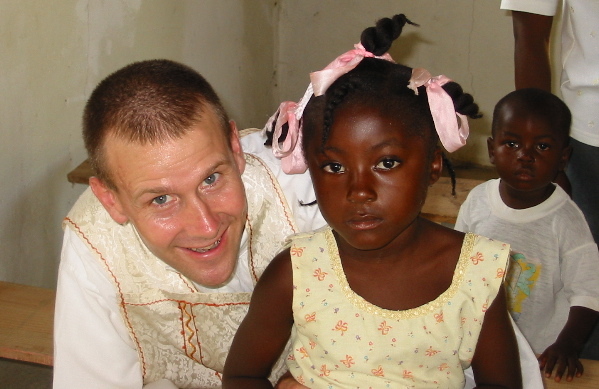 the countdown has almost terminated: i depart for Mass and 12 baptisms and then head off to the capital. then it's a big jet plane to the states. i will do my best to keep you posted on my exploits while "overseas". Published by frgee on Saturday, August 09, 2003 at 7:51 PM. Published by frgee on Friday, August 08, 2003 at 8:42 PM. your old friend martyr makes another appearance in the blog - he met us unexpectedly at a house along the road to Mass this morning and informed us that the usual way to the chapel was blocked and we'd have to take an "alternate" route, which he said "isn't a problem for the motorcycles." when i told him to get on, he shrugged and said, "no, i can run." i said, "get on, it'll be faster." so down we plunged, down, and down and down over nasty loose rocks (really they were small boulders) until the hairs on both of our heads were standing straight up (well, i guess mine always are). the climax of this detour was a ghastly super steep embankment that abruptly terminated at the river which we had to cross. 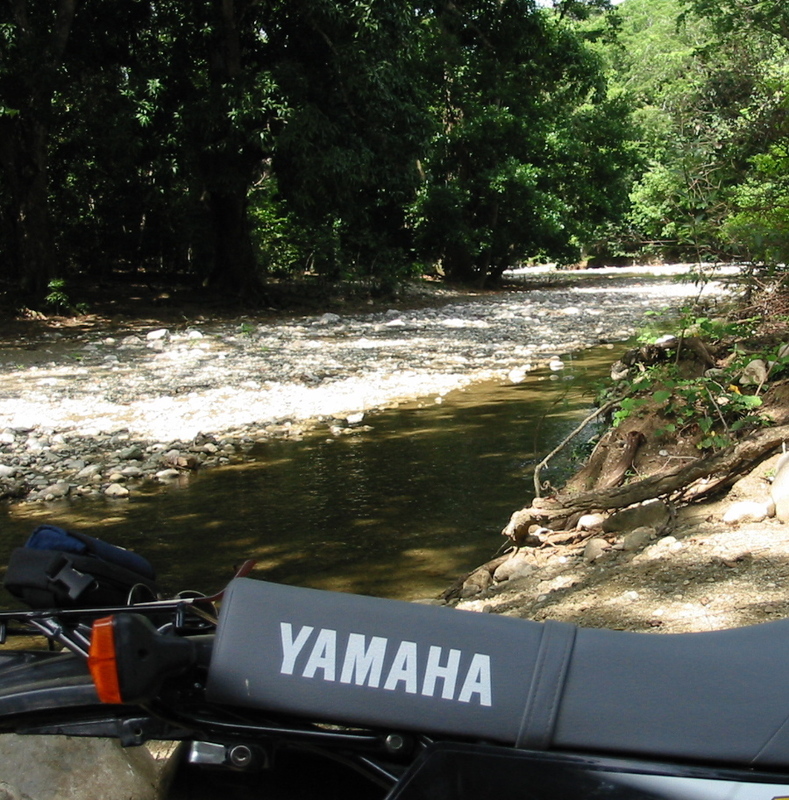 as we approached the final descent, the rear wheel glissaded down towards the river and we found ourselves cascading sideways towards a plunge into the rio tocino. luckily, i got the thing headed downhill after we smashed a rock and we made it without soaking ourselves. his response, "told you it wasn't a problem..."
Published by frgee on Thursday, August 07, 2003 at 7:13 PM. Published by frgee on Wednesday, August 06, 2003 at 8:59 PM. Published by frgee on Tuesday, August 05, 2003 at 6:49 PM. Published by frgee on Monday, August 04, 2003 at 7:34 PM. by the way - i will be celebrating 14 Masses from now until sunday morning. let me know if you need any intentions, cause i have a few extra. Published by frgee on Sunday, August 03, 2003 at 6:05 PM. i bet you wish you had this set up at your home. actually you don't need one because you have american power companies and co-operatives serving your electrical needs. this baby takes two 110v lines from the street and ensures that we get 110v to the outlets, because all too aften the supposed 110v comes in at 60v or 135v. 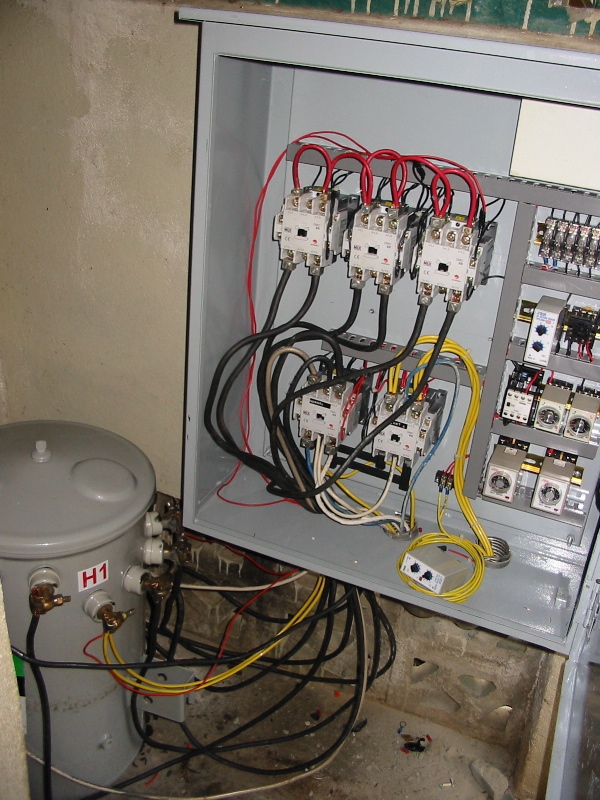 it also automatically cranks up the generator when the power fails, which happens about 4 times a week for expended (3-12 hour) periods and sometimes for days at a time. no more surges to 150 volts! no more wires burning out! no more boosters blowing up! oh electrical bliss!!! Published by frgee on Saturday, August 02, 2003 at 8:46 PM. first off i want to wish everyone, and especially all those people in woodbridge, a blessed feast of Our Lady of Angels! Published by frgee on Friday, August 01, 2003 at 9:17 PM.